The newest member of GWO's global training provider network has been unveiled, with Guodian United Power-owned Star Wind Energy receiving its certification at a ceremony in Beijing today. The company joins a fast-growing group of GWO certified training providers in China and is the first business in that country to receive authorisation to train both the Basic Safety Training and Basic Technical Training standards. 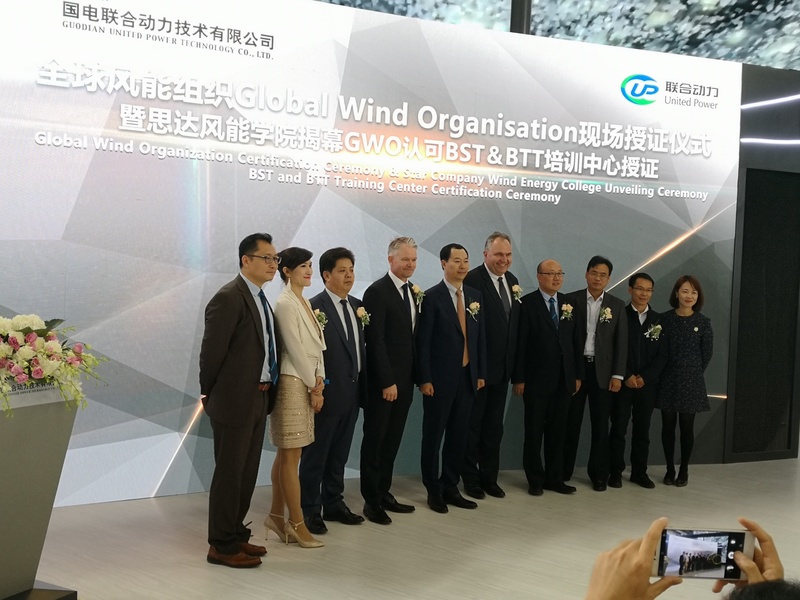 GWO Chief Executive Jakob Lau Holst congratulated Guodian and Star Wind Energy on its certification at a ceremony held at this week's China Windpower conference. "I am delighted to be given the honour of presenting Guodian United Power and Star Wind Energy with their GWO certification today," said Jakob. "It is the stated aim of our Chinese member companies to have an increased number of training providers able to deliver according to GWO standards and this represents a further step in achieving that goal. I look forward to working with them and all of our Chinese stakeholders on an increasing basis over the coming months and years." The Star Wind Energy training facility was certified by TÜV Rheinland.